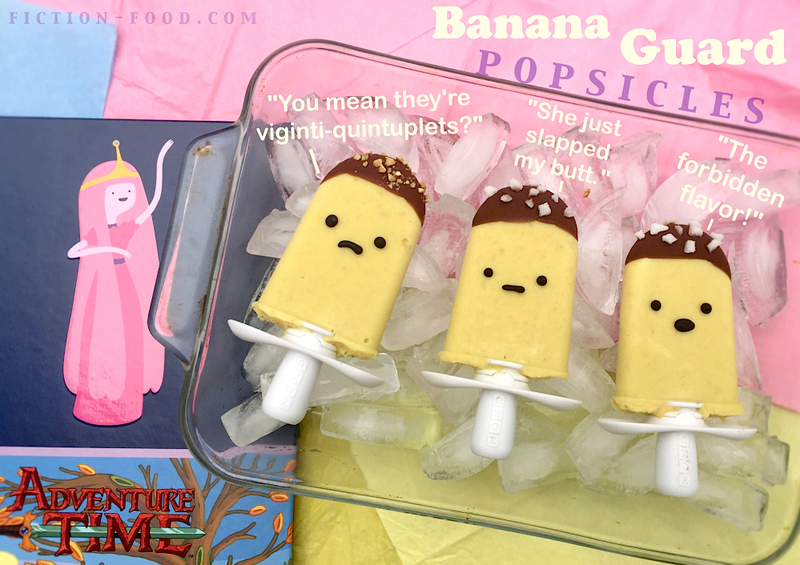 Fiction-Food Café: Banana Guard Popsicles | "Adventure Time"
Banana Guard Popsicles | "Adventure Time"
While not the freshest fruit in the basket, the banana guards are very loyal to Princess Bubblegum and serve as security guards, bodyguards, emergency services, police, and military. Like the LSP berry popsicles, this very easy recipe is adapted from the Zoku Quick Pop Maker recipe book. There are so many great ideas in there! But don't worry, you can totally do this with a regular popsicle mold too. 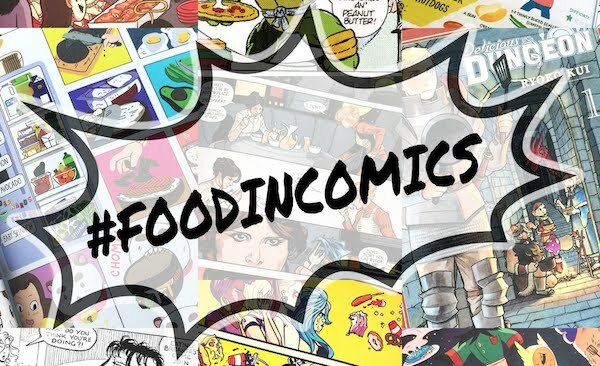 Be sure to check out Boom! Studios Banana Guard Academy by Kent Osborne and Mat Rupert! Note: The recipe below calls for chocolate quick shell and you can either buy some in the store, or you can easily make your own! Simply combine 1/2 Cup Semi Sweet Chocolate Chips with 1/4 Cup Coconut Oil and zap in the microwave at 30 second intervals (stirring each time) until melted. Let cool and, there you go! In the show, the banana guards have sugar bits on their heads so the recipe below calls for broken up sugar cubes. If you can't find any cubes though chopped peanuts are fine! Also, if you'd like to make Captain Banana Guard, instead of any kind of bits on the chocolate topping, put a little swirl of whipped cream (like, put Cool Whip in a baggie with a snipped corner and pipe it on) and use a toothpick dipped in quick shell to draw a mustache and eyebrows (along with the black candy melt eyes and mouth). 1. 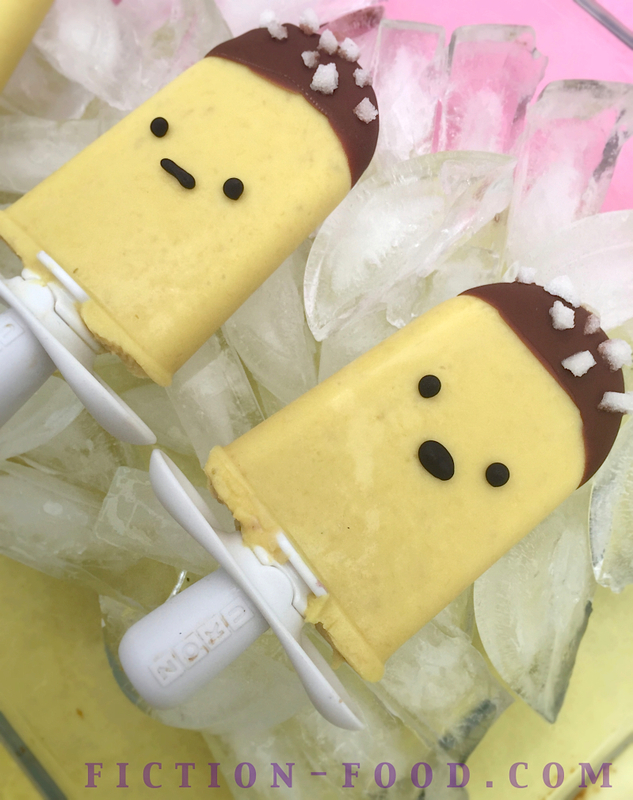 In your blender, puree the banana, milk, lemon juice, sugar, & 1 drop of yellow (I didn't want to make it too artificial looking, but you can add more yellow if you want) until smooth & then pour the mixture into your popsicle mold & freeze. If using the Zoku, freeze all of the pops & then place them upright in the storage container & place it in the freezer. If using a regular popsicle mold, once all of the pops are frozen, remove them from the mold & stick them upright in the styrofoam block & then place it in the freezer. 2. Squeeze or pour your chocolate quick shell (store bought or homemade-see note above) into a small bowl. 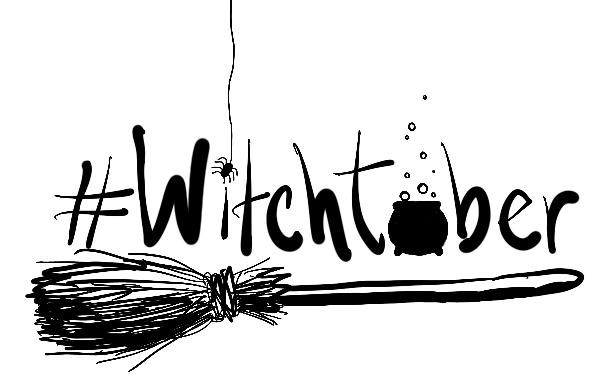 Have your sugar cube pieces or optional chopped peanuts at the ready. Take 1 popsicle from the freezer & dip the top of it in the quick shell, rolling it from side-to-side if needed to get a nice layer, & then quickly place several pieces of sugar (or nuts) in the chocolate before it dries. Place the pop back in the freezer & do this for all of the pops, 1 at a time. 3. Melt the black candy melts in the microwave in 30 second intervals, stirring each time, until smooth. Let cool for a few minutes, but not so much that it solidifies. Fill a plate or shallow bowl with ice cubes & then remove 1 popsicle from the freezer & lay it on the ice. Using a toothpick dipped in the black candy melt, draw eyes & mouth on the popsicle & then place the popsicle back in the freezer. 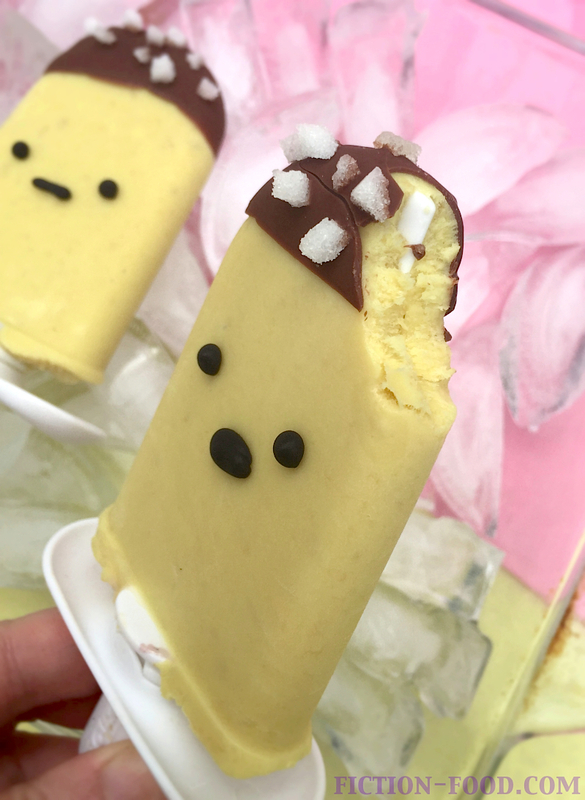 Repeat this until all of your little banana guard popsicles have faces!